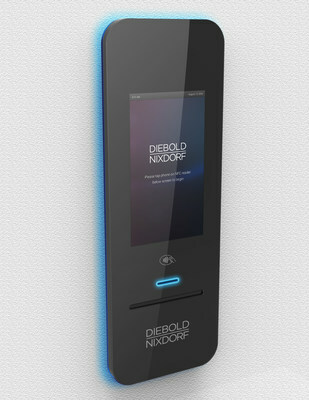 NORTH CANTON, Ohio, April 5, 2017 /PRNewswire/ -- Diebold Nixdorf (NYSE: DBD) is introducing a new, innovative banking concept, Essence, that features a sleek, modern design and user interface to advance the future of connected commerce. Powered by software-driven interactions, the intuitive multi-touch functionalities that consumers have come to expect from smartphones and tablets, such as swipe, scroll and smart zoom, enhance and modernize everyday consumer banking transactions. Clean design: A seamless profile, antimicrobial glass touchscreen display and enhanced user interface combine to deliver the future of consumer transactions. Increased security: In addition to the encrypted touchscreen PIN entry and NFC authentication option, the magnetic stripe card reader found on traditional ATMs has been replaced with an EMV chip card reader to authenticate the consumer and eliminate the risk of card skimming. Endless possibilities: An array of customizable colors and designs and electronic receipt capabilities provides consumers a glimpse into the future with this modern concept. Miniaturized footprint: By eliminating the traditional magnetic stripe card reader, receipt printer and PIN pad, the concept meets the needs of busy, technology-minded consumers and the compact, through-the-wall design fits in busy environments without compromising valuable space. "Our latest concept delivers the future of consumer transactions by reimagining what the self-service channel looks like," said Richard Harris, Diebold Nixdorf vice president, design and new technology incubation. "Diebold Nixdorf is uniquely positioned to connect physical and digital channels and guide financial institutions and retailers into the future of connected commerce."